passengers, or both. Its also equipped to accept litter patients in medical evacuation missions. Cargo such as jet engines can be transported from shore to ship in a matter of hours. A cage system or transport stand provides cargo restraint for loads during carrier launch or landing. The large aft cargo ramp and door and a powered winch allow straight-in rear cargo loading and downloading for fast turnaround. The C-2As open-ramp flight capability allows airdrop of supplies and personnel from a carrier-launched aircraft. This, plus its folding wings and an on-board auxiliary power u n i t f o r e n g i n e s t a r t i n g a n d g r o u n d p ow e r self-sufficiency in remote areas, provide an operational versatility found in no other cargo aircraft. C-2 SKYTRAIN.The C-9 Skytrain (fig. 8-51) fleet is located throughout the continental United States, Europe, and Asia. The Navy and Marine Corps C-9 aircraft provide cargo and passenger transportation as well as forward deployment logistics support. The Air Force C-9s are used for medical evacuation, passenger transportation, and special missions. The C-9 Skytrain is the military version of the McDonnell Douglas DC-9 used for many years by commercial airlines. C-12 HURON.The C-12 Huron is a twin-engine logistics aircraft that carries passengers and cargo between military installations. The C-12F provides logistics support between Navy air stations. Its powered by two PT-6A-42 turboprop engines and can deliver a total payload of up to 4,215 pounds. The cabin can carry cargo, passengers, or both. It is also equipped to accept litter patients in medical evacuation missions. C-130 HERCULES.The C-130 Hercules (fig. 8-52) is a four-engine turboprop aircraft. Its the workhorse of the military services, capable of landing and taking off from short, rough dirt runways. Its a people and cargo hauler thats used in a wide variety of other roles, such as gunships, weather watchers, tankers, firefighters and aerial ambulances. There are more than 40 versions of the Hercules, and it is widely used by more than 50 nations. T-45A GOSHAWK.The T-45A Goshawk (fig. 8-53) is a tandem-seat, carrier capable, jet trainer. 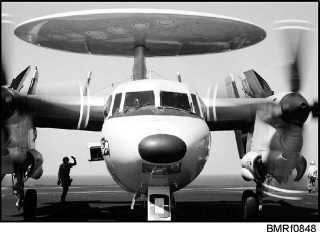 The 8-38 Student Notes: Photograph courtesy of PH2 Damon J. Mortiz Figure 8-48.E-2C Hawkeye waits for direction prior to flight operations on the USS Enterprise (CVN 65). Photograph courtesy of LCDR Mike Harrison Figure 8-49.ES-3 Shadow landing aboard USS George Washington (CVN 73). 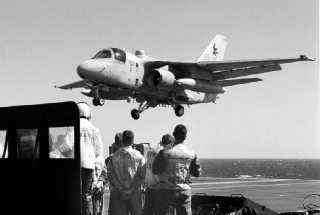 Photograph courtesy of Larry Smith Figure 8-50.C-2A Greyhound landing aboard USS John F. Kennedy (CV 67).